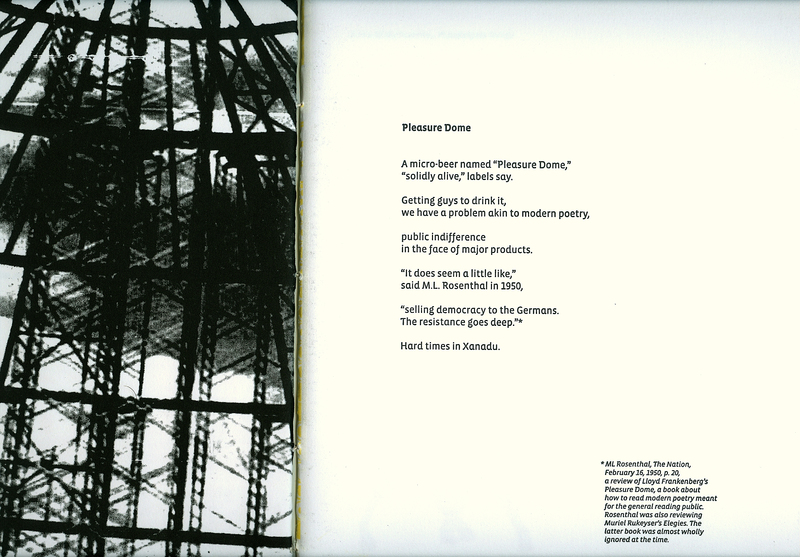 A poem of mine, "Pleasure Dome," was published in a gorgeous letterpress production of The Common Press, of which the Kelly Writers House is a partner. The book is called Philacentrik and it's a catalogue of nine views of Philadelphia. It is also the first Common Book, an annual project by the Common Press, the letterpress studio at Penn; Common Books will be produced to showcase the integration of writing, printmaking and design at the press." Here is a scan of my poem and the illustration on the facing verso. The Writers House imprint within the Common Press collaborative is called "The 15th Room Press".